Cruise from Cape Town to "Nowhere"
Where does the cruise to nowhere go? (we often get asked this) - usually the Captain will steer the ship into an area where the weather is best, so passengers can enjoy some fun in the sun and calm waters. The cruises to nowhere from Cape Town are extremely popular and normally sell out months before departure. For the 2017/2018 cruise seasons, cruises from Cape Town to nowhere will be on the MSC Sinfona cruise ship, which replaced the MSC Opera. Email cruises@southafrica.to to make a reservation, or to ask questions - our friendly assistants are only to happy to help. This is a review of our MSC Melody cruise to nowhere (more or less Mossel Bay), which left Cape Town on the 14th Jan and returned on the 17th Jan 2011. We're happy to report that embarkation procedures at the Port of Cape Town have improved substantially since the review was written. Here's a photo of the Melody at the Eastern Mole in Table Bay Harbour. I like the fact that you can feel the roll of the MSC Melody in the waves of the ocean, and the hum of its engines. Some of the larger cruise ships are just too stable, to the extent that you don't develop sea legs (i.e. that feeling when you first get ashore that you still need to compensate for the roll with your legs). We were initially meant to embark at 12h00, but due to the late arrival of the Melody we got an sms the night before the cruise, telling us that embarkation was being moved to 15h00. Embarkation took place at the Eastern Mole of Table Bay Harbour (turn-off near the Royal Cape Yacht Club), which contrasted starkly with the previous embarkation point at the V&A Waterfront part of Cape Town harbour, in front of the Table Bay Hotel (see photos of MSC Rhapsody cruising into Cape Town). (Ed: The Eastern Mole is now longer used as a passenger ship embarkation point). The Port Authorities in Cape Town would do well to improve the facilities - there were 2 tents which could not fit even a quarter of the passengers, and the rest of us made do outside with a strong wind blowing dust onto us.....eventually at 18h30 we got on board the ship. And if you wanted to breastfeed your baby, you got directed to a dirty portaloo. C'mon Cape Town, we can do better than this. Here's a photo of the tent on Table Bay Harbour's Eastern Mole, where the luggage is stacked (literally), before being moved aboard the MSC Melody cruise ship. Here's a tug fighting the swell in the harbour, and it was so windy that stones were used to hold down the cruise cards inside the tent. If, like us, you have a long wait until you can board your cruise ship, I recommend the views at the end of this jetty on Table Bay Harbour's Eastern Mole. Take care, if it's windy, that you don't get blown off! Because the winds were over 60 knots per hour, the Port of Cape Town was closed, and the ship eventually left the Port at 02h10 when the winds had died down. To make up for the delays, they offered free cocktails in the lounges between 10pm and 10:30pm. The dhal lentil soup was a big winner for me (although some found it too salty). Drinks are usually charged for, so take full advantage of the occassions when they're free - in the mornings there are free juices and tea/coffee, watch out for announcements of free or discounted cocktails and drink the water from the taps in your room. If you buy water, buy 1.5 litres instead of 0.5 litres (1.5 litres costs $2.30 while 0.5 litres costs $1.3). The cocktails seem to be made with syrups, so don't, for example, expect fresh strawberries with your strawberry dacquaries. Our cabin was a category 9 outside cabin, which appeared larger than those on the MSC Sinfonia cruise ship. We had a double bed (which wasn't just 2 singles pushed together) and a double-bunk. Our room was kept clean and tidy by a friendly fellow by the name of Ricorbert (spelling?) from Madagascar. Two tugboats. On the left, the tug is battling the wind in Table Bay Harbour. On the right, the tug is manoevering to guide the Melody into the harbour. Most of the way we found we could get cellphone reception, but 3G connections were less than intermittent. The best connection was achieved when we were at anchor in Mossel Bay. The WIFI hotspot in the MSC Melody was expensive ($20 for 60 minutes) and offered a slow connection. Unfortuanately, some of my email accounts were blocked from downloading their emails - I suspect that they are blocking what they consider to be non-standard ports (for whatever reason, most likely security). Most people are aware of the black boxes in plans, and ships also have them - called Voyage Data Recorders (and like those in planes, they are orange, not black). The protective storage unit is tamperproof and designed to withstand the ship sinking, storms, heavy seas, fire, collision, explosion and shock. Here's the MSC Melody's Voyage Data Recorder, which can be seen on its top-deck. The boat eventually left Table Bay Harbour at 02:30am, at 0700am it passed Cape Hangklip, 1012am we passed Cape Aghulhas and at 1730pm we reached Mossel Bay. Wind speed was 70 knots and we cruised through 4m high swells (sea was too rough to go out and sea Mossel Bay). Here's a photo of the MSC Melody anchored outside Mossel Bay. Activities included dance lessons, pilates, aerobics, stretching, general knowledge quizes, ball games, bingo, cinema and cabaret shows. Whilst watching us round Table Mountain at about 6am, a young man let me know that he'd only left the disko an hour ago. He was having some difficulty ordering a black label beer, and bemoaned that "there's no place for a white moffie in a black country". After giving the man the beer, the barman said "Thank you Sir", to which he replied, "How many times must I tell, it's Ma'am, not Sir"! There's plenty of activities taking place around the Calypso Pool. Here's the wet t-shirt swim. The pool was filled with salt sea water in Cape Town, so was pretty cool on the first day, but had warmed up by the last. Next to the pool are 2 jacuzzis, which are very popular amongst the kids. A lot of the organised activities take place around the Calypso pool. There is also an indoor pool, which isn't as popular. On the morning of disembarking I got up at sparrow fart (we had to be out of our rooms at 7am), and wondered around the ship in a sleepy state, where I was half-dreaming half-awake (of course on a cruise the awake state is anyways similar to feeling dreamy). When we got to Cape Town, 2 tugboats engaged to pull us safely into Table Bay Harbour's Eastern Mole. Here's a view of Table Bay Harbour and Cape Town. Starlight Cruises emailed us the following terms and conditions, together with an electronic file containing our tickets (which we had to print out). NOTICE TO PASSENGER: Attached are your Board coupon, Passenger Ticket and (if contracted) Transfer Voucher. Before accepting them, carefully read all the terms of the following Passenger Contract which contains important conditions and limitations. Clauses 20 to 26 set out some of your rights, MSC Crociere?s limitations of liability, court jurisdiction and time limits to file claims or to bring suit. servants and subcontractors. Please retain this document for future reference. this Ticket and shall not affect its construction. or of any other clause of this Contract. other means of transport provided by the Company to the Passenger. person authorised to receive the Ticket and Contract on behalf of the Passenger. imposed by any government agency. and may adjust the Fare accordingly. insurance coverage prior to departure. arrange transportation to the substituted port at no expense for the Passenger. received, and the Company shall have no further liability. are considered cancellations and will be subject to charges. clause 7 and 8 above apply. notices and to pay any refund owed to the Passenger to the Agent on his behalf. incurred by the Company on his behalf, before the end of the Voyage. entry or exit permit, required by any port on the Cruise Ship's itinerary. Ship for security reasons at any time. to a health facility at any port, at the Passenger's expense. U.S.A. the same conditions apply for passengers under age 21.
for the actual medical services rendered ashore. whom are considered beneficiaries under this contract. contractors even if sold by Agents or Organisers on board the Cruise Ship. for the conduct, products or services provided by such independent contractors. any commercial property shall be subject to an additional charge. signed by the Passenger and Company and is added to the Ticket and Contract. him during the Voyage if necessary. will be stored at Passenger risk and expense. contribution in respect of baggage or personal effects or property. The applicable law to this Contract shall be Italian law. and be subject to the exclusive jurisdiction of the Courts of Naples, Italy. severe negligence of the Company. clause and not to the whole contract. Company shall have the right to any limitation and all defences available herein. sent by registered mail to the address in Clause 25 (A) above. made within three (3) days after such injury or death. after six (6) months (185 days), from the Passenger's disembarkation. Whilst on your cruise keep an eye out for other ships sharing the seas with you. 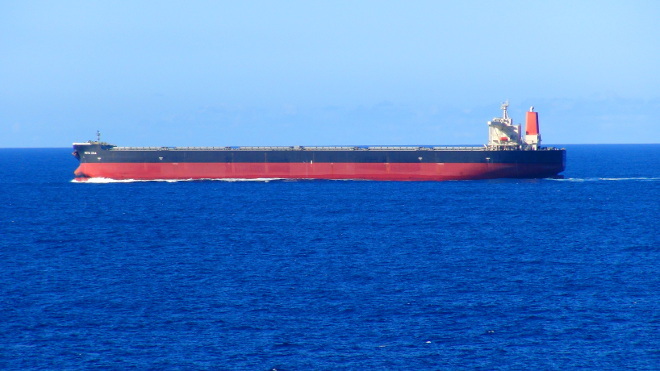 Here's the Nova Era, a bulk cargo ship I spotted some 50 nautical miles outside Cape Town (in January 2015). I did a quick internet search, and she's from Liberia with a home port in Monrovia.